One man was robbed near Jackson Avenue and O.C. Haley Boulevard over the weekend, and a woman was attacked and stabbed near Jackson and Freret the following day, New Orleans police said. Around 11 p.m. Saturday, Sept. 1, a man in his early 20s was approached by three assailants who were inside a white Chevrolet Impala near Jackson Avenue and O.C. 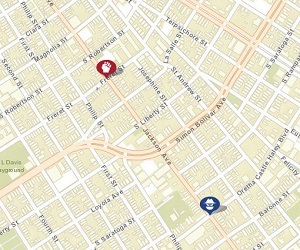 Haley Boulevard, according to the initial NOPD report. They threatened him with a handgun and took his belongings, and then drove off, the report states. Around 3:30 p.m. Sunday, a woman in her 50s was walking in the 2200 block of Freret Street (near Jackson Avenue) when a stranger “physically assaulted her,” according to the report in that case. She fell to the ground and tried to escape, but he stabbed her in the right thigh, the report states. She was taken to the hospital for treatment by ambulance, the report states. Further details were not immediately available. Anyone with information about either incident is urged to call the NOPD Sixth District station at 658-6060 to speak to a detective, or CrimeStoppers at 822-1111 to leave an anonymous tip that could be eligible for a cash reward.